Northern Illinois University quarterback Chandler Harnish was named the Mid-American Conference West Division Offensive Player of the Week Monday after throwing for a season high 281 yards and tying his career-high with three touchdown passes in NIU’s 50-14 victory over Akron. Harnish completed 80 percent (16-for-20) of his passes against the Zips to become the MAC’s leader in passing efficiency (158.6). The Bluffton, Ind. native threw touchdown passes of seven, 16 and 58 yards and the Huskie offense scored every time it had the ball with Harnish at quarterback, a total of eight straight possessions. Harnish and the Huskie offense also stretched the field against Akron as he connected on passes of 47, 58, 32 and 26 yards in the game. His 281 yards passing against the Zips marked the sixth time in his career, and the second time in 2010, that Harnish has thrown for more than 200 yards in a game. 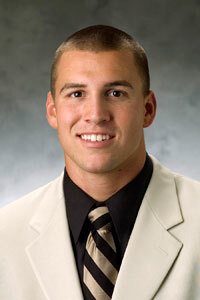 Harnish earned his first MAC player of the week honor in 2008 when he earned two POTW honors following performances against Minnesota and Kent State. Harnish is the fourth NIU football player to earn a MAC weekly award this season. Tailback Chad Spann and defensive back Jimmie Ward were the MAC West offensive and specialist of the week following the Minnesota game, while punter Josh Wilber earned special teams player of the week after his performance at Illinois. Northern Illinois opens a three game homestand this Saturday when the Huskies welcome MAC East leader Temple to Huskie Stadium.